This is the second US forex brokers account profitability report after the first ever report I published back in October 2010. This time the report is more full and includes the numbers of FXDD for the first time (although I still lack the number of accounts) and of Advanced Markets (lacking Q4 figures). In line with my earlier projections, the average account profitability has “increased” almost with all brokers. The reason? Probably numbers manipulation and a genuine interest in seeing better numbers than what appeared in the first report. Bottom line: Oanda is still the leading broker by far in terms of accounts profitability and number of accounts. I expect the profitability gap to slowly close as more brokers will start paying interest to clients’ accounts thus affecting profitability numbers. In terms of account numbers in the US it would be difficult to compete with Oanda but it’s possible that worldwide FXCM has more accounts. Unfortunately we are not able to make such a comparison as these numbers are unknown. FXCM and Gain have gained over 3,000 accounts each which may or may not be due to repatriation of US accounts back from other non-US subsidiaries. If this is the case we will see the change in number of their accounts almost flat in the next report. 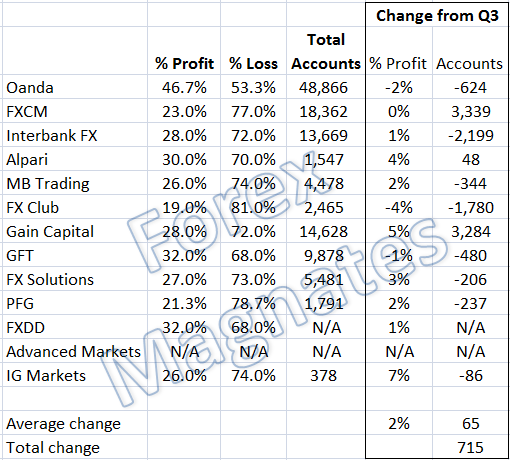 Interbank FX and FX Club however seem to have lost around 2,000 accounts each. The only brokers whose accounts profitability decreased from Q3 2010 were FX Club, Oanda and GFT. Biggest gain in profitability was for Alpari, Gain and FX Solutions (IG Markets jumped whopping 7% but with such small number of accounts it’s really hard to compare). On average the account profitability for all US accounts rose by 2% (see the possible explanation for this above). On average the total change in the number of US forex accounts was almost zero (less than 1 percent) and there are about 120,000 total active forex accounts in the US. This also means that if we exclude FXCM and Gain’s repatriation of accounts into consideration then the total number of US forex accounts has actually significantly decreased in Q4 2010. Not surprisingly the severe CFTC’s limitations on trading and leverage have scared off some of the investors who may have moved their accounts to non-regulated offshore brokers or just stopped trading forex altogether. I believe that the former is the real explanation behind this drop. We will see in the next report whether the accounts number decrease tendency continues (I believe it would). Q4 is a tough quarter having December be a month where people tend to stay away from the markets. I think that you are right regarding the number of US accounts shrinking and most brokers I know are not focusing on the US market but focusing on the middle east, Asia and Latin America where they believe additional growth will come from. I also think that by the next quarter you will see fewer names on the list because FXCM and Gain are going to use their added cash from the IPO to purchase some of the brokers. This is amazing, with only a few hundred accounts a broker can be in business. IG Markets – under 400. I’m wondering if they only report the accounts in the US? I thought they were pretty big so it must be only the US clients. Is this report available as a comparison like that or the figures are only published to specific brokers on the NFA website?